Barack Obama is already going down in history books as the coolest president, and now to add to his list of accomplishments, he's eaten with chef and legendary foodie Anthony Bourdain in Vietnam. The pair dined together as part of President Obama's week-long trip to Vietnam, and their meal will reportedly be featured on a future episode of Bourdain's television show Parts Unknown. Fittingly, Obama and Bourdain's meal looked delicious — Bourdain had to show the president Vietnam's best (though the meal itself cost a grand total of $6, and Bourdain graciously picked up the tab for the leader of the free world). The pair ate at a restaurant called Bún chả Hương Liên in Hanoi, the country's capital city. It's flanked with small, plastic stools and cold tiles, a bit of an odd sight for a president. The eatery's special is right in its name: Bún chả, which is a traditional dish from Hanoi that consists of grilled pork served in a dipping sauce or broth, alongside rice noodles and herbs. However, Obama and Bourdain branched out from the usual special and they each ordered a bowl of pho (a traditional Vietnamese noodle soup), a plate of greens, and topped it all off with a cold Hanoi beer. All of that for six bucks is a pretty amazing deal. 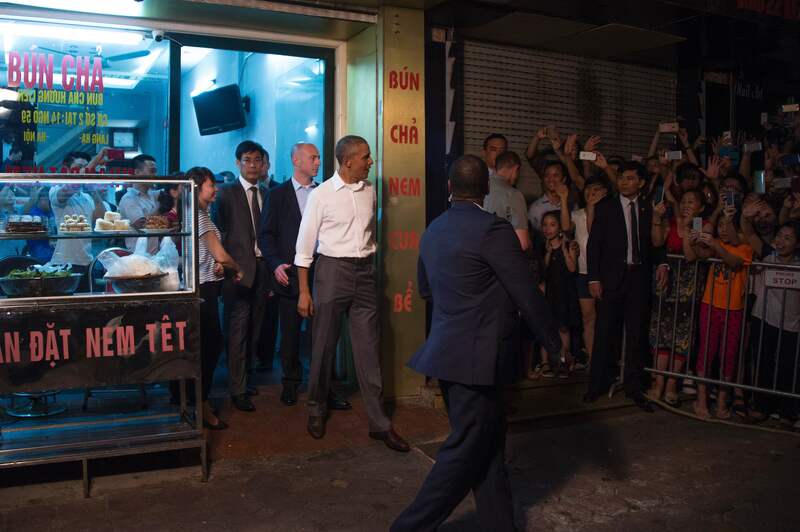 But eating in a place like Bún chả Hương Liên perhaps underscores a larger desire than Obama's craving for noodles. (Though, admittedly, the noodles could likely stand as motivation enough on their own.) President Obama's dinner with Bourdain was a pit stop within his week-long trip in Asia. The administration is pivoting some of its focus in its final months to Asia, and just hours after Obama sat down for his meal in the capital city, he announced that the United States will be fully lifting its decades-long ban on the sale of military equipment to Vietnam. Aside from its delicious food, sitting down at a locally-owned restaurant in the heart of Vietnam could only do good things for Vietnam's image of the United States. And by keeping the eatery quaint, President Obama got to aid the local economy and look cool while doing it. President Obama seemed to impress the famous chef, too. In an Instagram post, Bourdain noted that "the president's chopstick skills are on point." Now I'm wondering the best way to score a meal with the president, who has got to be the best foodie around, thanks to Bourdain's insider expertise.